I originally made this join for my 13th Textured Circles piece, but I ended up re-working that to attain my final measurement. This join can be used for any type square! Use any yarn. I like Scheepjes Colour Crafter! It’s economical, soft and sturdy, and perfect for everyday projects. Read more about this yarn on my Crafter site. Enjoy! **I have relocated this post to my crafter site to further organize my free pattern library. Thank you! This post features affiliate links! Posted in Free Patterns, Textured CirclesTagged Brights, celtic lace join, Crochet, Free Patterns, Join, Lace, Texture, Tip: Joining. joiningBookmark the permalink. This is a gorgeous edging, the cream really frames the lovely colours of the circles. Lovely! Hope to try this when my other million and one UFOs are done. How many stitches does a square need to have on its edges so this join comes out evenly? Also, can you join squares that have different numbers of stitches? Michelle, I just started using this beautiful edging on a wedding afghan using 3 different patterns for the squares. The main thing is to make sure you have the same number of V stitches on each square. For mine I have 9 on each side. Since my squares didn’t all have the same number of stitches I had to skip 4 stitches instead of 3 between a few V stitches for them to all be the same. I hope that helps. Beautiful! How do you continue connecting motifs after #2? Hi, there! Visiting my tutorial on Flat Braid Join will help! It’s the same concept, just that the Celtic Lace Join is more complex. Good luck! Chain 2, Join to next chain space of completed motif, chain 2, SC in center DC of next 5DC group. Do I join by taking my hook out of the loop and inserting into the next chain space, like I did for the initial join? Or do I just put my hook straight into the chain space and go on with the next ch 2 without removing my hook until I reach corners? Hi there! You need to remove your hook each time you join. Pull the stitch through and keep chaining. So the chain stitch made will “encase” the chain loop from the completed motif. Hope that helps! Glad you like it – you’re making me want to do some lace again! On the first motif the joining spaces are 5 chains each. The remaining motifs get a total of 4 chains for their joining spaces: 2 chains, slip out of the hook, slip into the 5-ch sp, back into the hook, then 2 chains. Thanks again for making my crochet world so so so pretty! Well I would say the joining blocks still get 5 joining chains – the “center” chain is the “joining” chain. So you’ll feel like you’re doing 2 chains, then 3. Ah, that makes sense! I was missing the chain one of the join. Thank you! I am having a hard time understanding how to join after the first motif. Is there a you tube video to watch? This is a beautiful stitch hoping I can get it figured out. Do you break off the yarn on each motif? I absolutely love this edging. I’m making a rose (three dimensional) bed throw. Alternating a plain cream colored square with a rose square. This edging is making the whole thing just “pop”. What a beautiful way to “frame” the roses. I haven’t yet joined the squares, so we’ll see if I need some help, but in the meantime, thanks for such a beautiful edging! 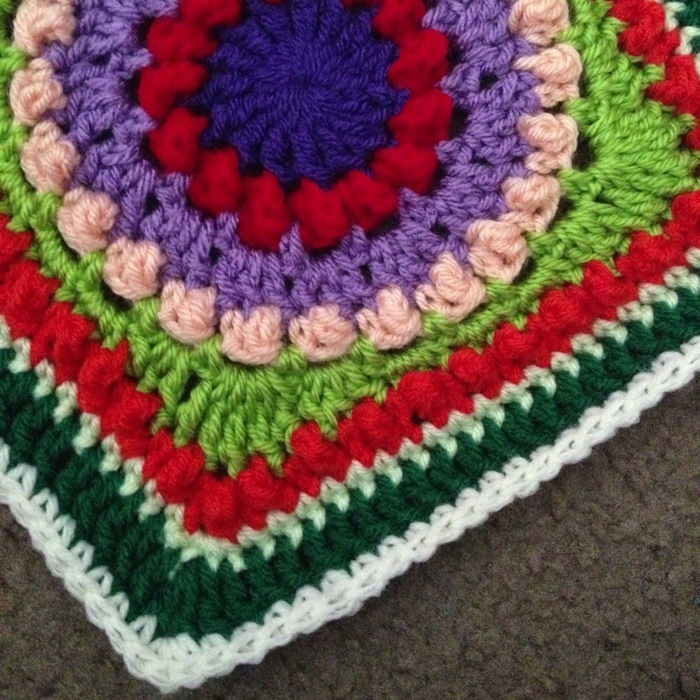 Pingback: Get It Together: How to Join Crochet Squares 12 Ways! Pingback: Grandbaby Granny Square Blanket | Goats and Hounds! thank you so much for this with the clear photos. i’m making a lacy pattern of grannies that had instructions for joining that were so vague a genius couldn’t have figured it out, not to mention i went out and tried to find some kind of book about joining that was clear and failed. this is exactly what i needed. I want to thank you for this lovely join. I am making a king size bedspread with three dimensional roses in every other square. I didn’t like the join provided in the pattern. One day I stumbled across this Celtic Lace join. At first I thought it would be too difficult for ! me to do, but I decided to give it a try anyway. Your instructions are so well written that I was easily able to do this. It has added a very nice accent to the roses. I love it. Thank you so much! I’m sure my daughter in law will love this. Absolutely beautiful pattern! I am a little confused and was wondering if you can help me. I’m on the secon row and am having a hard time figuring out how to connect the second loop (in photo #6 above)? I hope that makes sense. This is the most beautiful joining method I have ever used. Super easy when you get the hang of it. I’m doing lacy white squares joining with black[ my daughter’s favorite colors ] This will be a Christmas gift this year for her. Thanks so very much for sharing this! I will share when I get a little more done. spring time here is busy and I usually only crochet in the evenings, so it takes a while for my projects to get finished. Is there a video anywhere that could give me an idea of adding squares after the second square?? I have two weeks to finish a baby blanket:(. I love this join!!!! I am so enamoured with this Celtic Chain joining and am so grateful that you posted this tutorial with photos. I think I get it, but I am wondering what happens to the 5 chain loop at the very corners of the blanket. Do you omit those loops? Or are they picked up by the final border of the blanket? How do you do it? Thanks so much for your help. What I do is this: option 1) at the very corner of the blanket, work chain 3 instead of chain 5.. Or what I most often do: option 2) when you work the first round of the border, work (SC, Chain 3, SC) all in the Chain 5 corner so that the second border round you’ll have chain 3 in the corners instead. Either way works! Thank you for your kind words! 🙂 Happy crafting to you! This is beautiful and Dainty, good for making one larger. I used your Celtic lace join for an afghan that I made for my granddaughter. I think it is very beautiful and I love that it doesn’t make a ridge in the blanket like some joining methods do. I was wondering where the pattern for the final boarder it, that is shown around it in a different picture, I have looked for it but couldn’t see it. I have made a king single sized blanket and joined it with the Celtic boarder and just wanted to finish it off a little more. Can this be used with hexagons instead of squares?